My paintings consist of a number vibrant coloured planes. 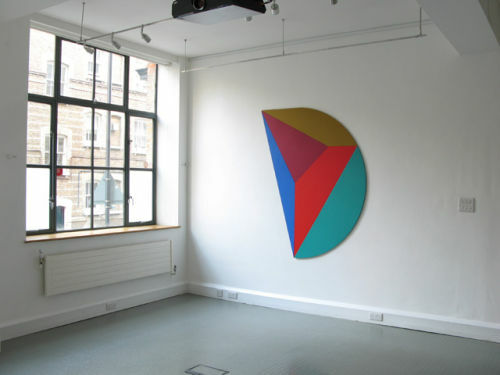 The shape of these planes evoke a perspective and illusionistic space, however this is undermined by the juxtaposition of different colours around a central plane. The different edges of this plane are pushed back or forward depending on the colour of each juxtaposed plane. Therefore seemingly flat shapes appear to twist and flip back on themselves. This achieves a surface, which is simultaneously asserted and denied, undermining any logical or mathematical interpretation of the work. This is complemented by the overall shape of the painting support, giving many opportunities for the interplay of spatially ambiguous planes. Each painting endeavours to achieve a compelling physical presence through its ambiguous internal spatial relationships. To facilitate the many enhancements and transformations to the colour which need to be made during the working process, without destroying the crispness of form or edge, the work is constructed from separate panels of 6mm birchfaced plywood. Each separate colour in the work is painted on a separate panel . In the larger scale paintings these plywood panels are mounted onto a very thin hardboard backing board 2" smaller than the painting using Velcro.